This delicious broth, redolent with garlic and enriched with the vitamins and minerals of fresh spinach, takes its name from an old folk saying that garlic is as good as ten mothers. This soup is not only tasty and nourishing, it makes a comforting remedy for winter sniffles and sneezes. 4 cups chopped fresh spinach leaves, tough stems discarded. 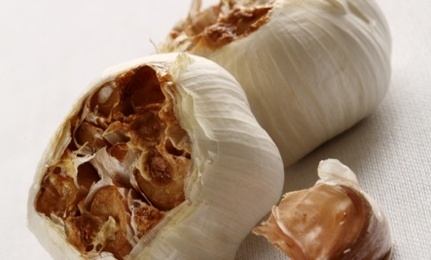 Remove the outer papery covering of the garlic. Slice off the top of each head so most of the cloves are exposed. Place on a square of aluminum foil for easy cleanup, or select the smallest baking dish you have. Drizzle 1 teaspoon oil over each head. Fold the foil over the garlic to completely enclose it, or cover the baking dish with foil. Roast for about 45 minutes, until the garlic is completely soft and lightly browned. When cool enough to handle, squeeze the garlic pulp into a medium-sized saucepan. Add the broth and stir well to combine. Simmer for 15 minutes to allow the flavors to blend. Adapted from The Roasted Vegetable, by Andrea Chesman (Harvard Common Press, 2002). Copyright (c) 2002 by Andrea Chesman. Reprinted by permission of Harvard Common Press. Adapted from The Roasted Vegetable, by Andrea Chesman (Harvard Common Press, 2002). Thank you---love garlic--uncooked is best! I love the garlic spinach soup, so yummy! Thanks for great recipe, this one I will try really soon!